You can't be robbed if you never had a chance to begin with. A waste of a spot! They keep trying to make Brenda happen & it's just not going to cut it. Everybody from AYTO3 doesn't have that "star power" and there's nothing wrong with that. Idk why Britni acts like she is one of the best competitors.....she legit thinks she elite. Britni has done nothing except beat literally the bottom of the bottom tier competitiors in eliminations and she acts like she's done something. She lost that mission for Chuck and is proving she's a below average competitior. 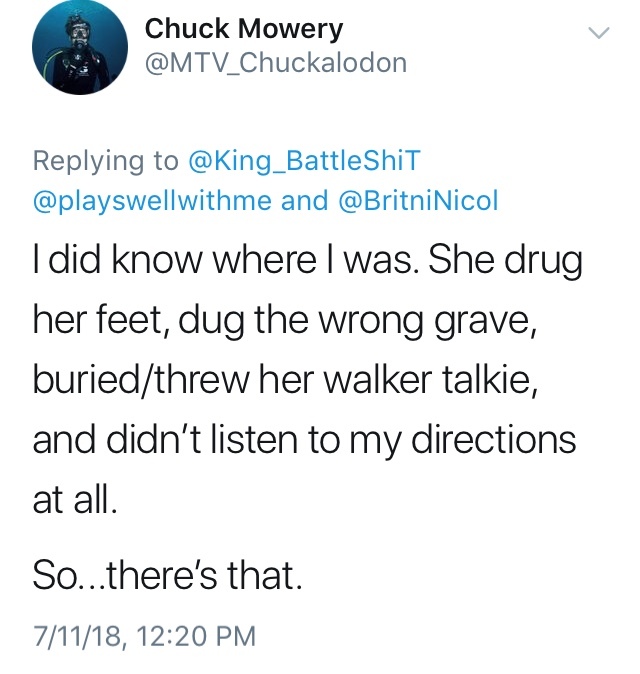 Didnt Chuck say "I dont know" when Britni asked what grave he was in? I think this false sense of elite-ness is happening due to the non-traditional Challenge format. Have the usual, winners send in losers, last place get's sent into elimination, and you'll have a more accurate idea on who's better than you and who is not. Brit lucked out these seasons are more crapshoot than anything. He is full of ****. The ******* is dumb as ****, and obviosuly didn't give her the right directions. After so much digging, I don't blame her for losing the w-t. She should've left him buried. I think she asked Chuck what his grave said so she would she know which of the 3 it was but all he said was "i dont know". notyourbusiness2 wrote:He is full of ****. The ******* is dumb as ****, and obviosuly didn't give her the right directions. After so much digging, I don't blame her for losing the w-t. She should've left him buried. She asked if his grave said MTV, Final Reckoning, or The Challenge, which he didn't know. Yeah exactly. His only job was to remember where he was and he couldnt remember. oh whoops read your comment wrong sorry. I actually like Britni most of the time but she was terrible on the last episode. She was soo extra when she didnt need to be. She had the perfect opportunity for a very real storyline with Chuck but instead put on a character and everything just seemed fake. She's obviously actually mad but when she tries to act ****** for the cameras it comes across very forced.